CooksRecipes has quality, kitchen-tested recipes for a variety of banana pancakes that you can count on for successful deliciousness. No matter what you call them, flapjacks, griddle cakes, breakfast cakes or pancakes, this banana oat version will satisfy the heartiest of appetites. 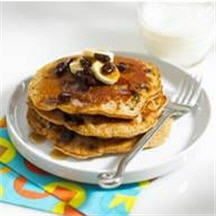 Start the day off with a wholesome breakfast of whole grain pancakes with raisins and bananas topped with Cinnamon-Raisin Syrup. These chocolate pancakes are delicious and make a special treat. 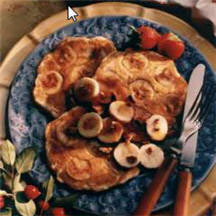 Serve warm with sliced banana and additional chocolate syrup for a family pleasing dish.